My friend Cassie just recently moved into a new house that had the MOST shelf space I think I had ever seen. 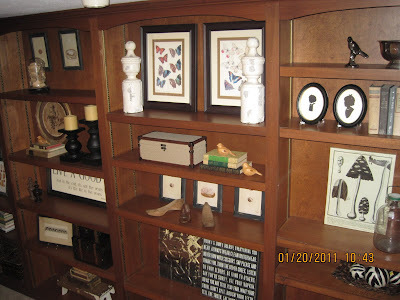 The shelves are in an unusual placement at the top of her stairs, which you can see from her foyer as soon as you enter the house, so the shelves had to be a show stopper. They run from floor to ceiling and are 7 feet high. Cassie was overwhelmed at the idea of filling the shelves and contemplated painting them. I must admit this was quite a challenge, but once we dove in, we really had a great time shopping for new and vintage items and found really unique fillers that fit Cassie's personal tastes and her decor. These pictures are before (below) and after (top) and I am so pleased with the result!